The latest firmware for your Katana amp model (if needed). The Katana driver for your computer’s operating system. BOSS Tone Studio for Katana. To find all these files, go to the product page for your Katana amp model and click on the Downloads tab. Before installing them, carefully read the instructions provided with the downloads. To get a PDF instruction manual for using BOSS Tone Studio with the Katana amps, click on the Support tab at your amp’s product page. If you don’t yet own a Katana amp, you can still download the BOSS Tone Studio editor and use it in offline mode to explore all the things it can do. Left to right: Katana-50, Katana-100, Katana-100/212, Katana-Head. Once your Katana is connected to BOSS Tone Studio, you’ll see an intuitive graphic interface for adjusting nearly everything in the amp. You can tweak amp tones, load and customize different effects, save and recall Tone Settings, and more. The software directly interacts with the amp, allowing you to intuitively create sounds as you play. Any editor adjustments you make are immediately reflected in the amp, and vice versa. At the top of the main Editor screen, all the amplifier controls are accessible. With fine control of each parameter from 0-100, you’re able to make microscopic tweaks and dial in sounds to perfection. BOSS Tone Studio for the Katana amp series: main Editor screen. 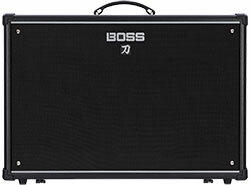 Along with its fantastic amp tones, each Katana amp also include access to 55 different BOSS effects. With BOSS Tone Studio, you can audition and edit these effects, and then load them up in the Katana’s 15 available onboard storage locations. BOSS Tone Studio for Katana provides access to 55 different BOSS effects. In the Booster, Delay, and Reverb categories, you can only load effects from those specific groups. But the Mod and FX categories can load effects from the combined Mod/FX group, allowing you to have the same effect assigned to both categories if you wish. You might find this desirable when setting up the effects chain, which we’ll discuss coming up. Each category has three different slots, and you can load a different effect in each. Seasoned players know that some effects work best before the amplifier, while others work best after the amplifier’s preamp section. As a general rule of thumb, you’ll want to use wahs, compressors, overdrives, distortions, and boosters in front of the amp, and reverb after the preamp. With mod and delay effects, it depends—you might want to use them in either location, depending on the sound you’re after. Effects can be arranged in three different chains. Once you load effects into the slots, you’re able to tweak them in fine detail. Each effect type has a full set of parameters to adjust, similar to what’s available in the GT-100, BOSS’s flagship multi-effects unit. BOSS Tone Studio for Katana provides deep editing of effects parameters. In addition to its five effects categories, the Katana also has a built-in noise suppressor. This can be helpful to tame background noise with high-gain sounds. It can only be adjusted with BOSS Tone Studio; there are no controls available from the amp’s panel. Unlike a simple noise gate, the Katana’s noise suppressor intelligently follows the sound’s natural decay, so it won’t harm the character of your tone. From BOSS Tone Studio, the Katana noise suppressor can be adjusted as needed for every Tone Setting. After you adjust the various parameters to your liking, you can save them as a Tone Setting in the Katana. Just click the WRITE button in the upper right corner of the Editor page, give the setting a name, and save it to the desired destination (CH1, CH2, CH3, or CH4). BOSS Tone Studio also includes a librarian that allows you to back up the current settings in the amp, work with Live Sets, and more. Basically, Live Sets provide a way to store and organize Tone Settings into groups for different gigs, songs, recording sessions, or whatever you want. When you want to load them into the Katana, just drag them to the desired locations in the left side of the screen. Librarian screen in BOSS Tone Studio populated with different Live Sets. When your computer is connected to the web, BOSS Tone Studio provides direct access to BOSS Tone Central. Simply click on the TONE CENTRAL button in the lower left corner to browse the many Katana Live Set collections created by top pro players. You’re able to audition audio demos of the sounds, and directly add them to your local Katana library. BOSS Tone Studio gives you direct access to Katana Live Set collections at BOSS Tone Central. Clicking on the SYSTEM button in the lower right corner will take you to some master settings for the amp and software. Here, you can adjust MIDI, USB, and device settings, download the latest Katana owner’s manual, and more. The Katana-100, Katana-100/212, and Katana-Head models are equipped with a rear-panel effects loop for patching in external effects devices. From the System page in the editor, you can adjust send/return levels for the loop, and set it for either series or parallel operation. Effects loop parameters in the system screen. Right next to the SYSTEM button is a PLAY button. Clicking this opens a screen that allows you to jam along with WAV songs stored on your computer. BOSS Tone Studio includes a built-in audio player. WHICH BLUES CUBE GUITAR AMP IS THE ONE FOR YOU? > WHERE CAN I TRY A KATANA-100/212 IN STORE?